Last week, a group of more than 100 retailers, restaurants, and associations sent a letter to lawmakers on the House Ways and Means and Senate Finance committees which includes a request for the committees to correct the “retail glitch.” The retail glitch refers to a drafting error in the Tax Cuts and Jobs Act (TCJA) which unintentionally increased the tax burden on a category of business investment called Qualified Improvement Property (QIP). According to the letter, this increase in after-tax cost is causing businesses to delay, and even turn down, investment opportunities that they otherwise would have pursued. QIP investments include projects such as flooring, lighting, sprinkler systems, or other types of remodeling and interior improvements to nonresidential buildings. 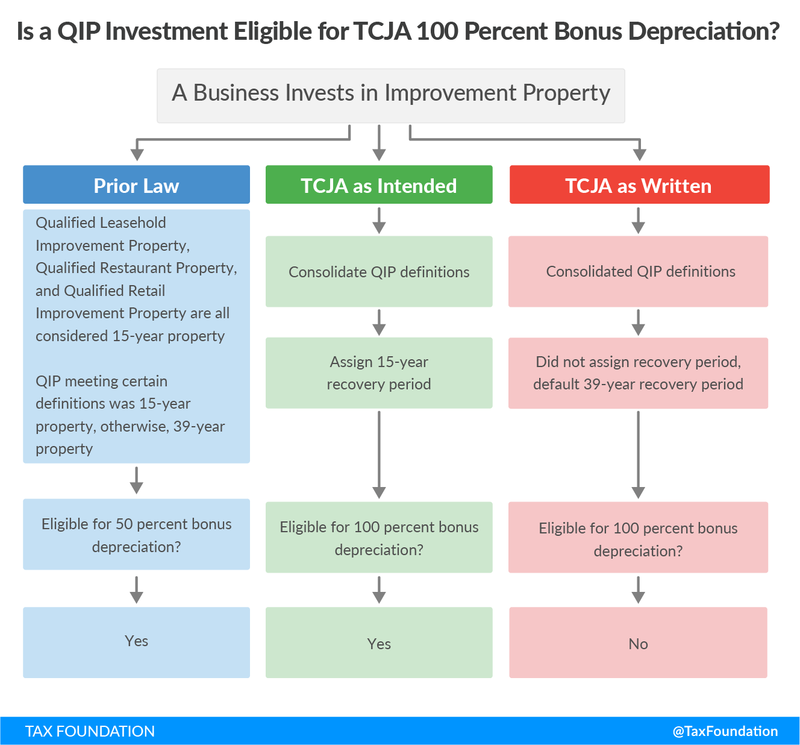 The TCJA intended to reform the various categories of QIP that existed under old law and improve the cost recovery treatment by making it eligible for the new 100 percent bonus depreciation provision. However, as written, the TCJA mistakenly excluded QIP from 100 percent bonus depreciation, which results in a greater tax burden than under previous law. This distinction, whether QIP is eligible for the depreciation provision, is a significant determining factor in the cost of making an investment. Under the TCJA 100 percent bonus depreciation provision, if a company makes a qualifying $100 capital investment it would immediately deduct the full cost of that investment. However, if the investment is not eligible for 100 percent bonus depreciation, the company must take depreciation allowances over the applicable recovery period, which prevents the business from ever fully recovering the initial cost of the investment. 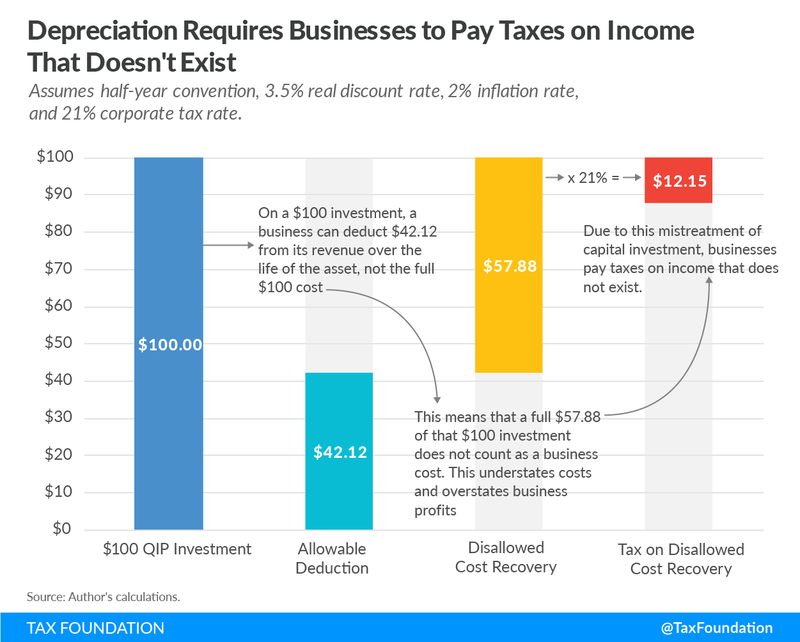 This inability to deduct the full cost of an investment overstates business profits, meaning businesses have to pay income taxes on profit that does not exist. 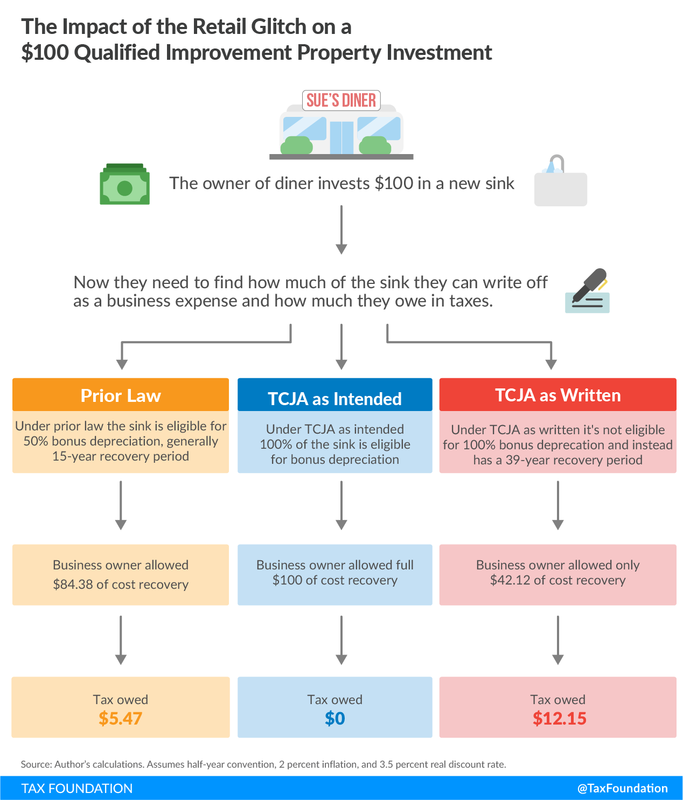 Figure 1 illustrates the general cost recovery treatment of a $100 QIP investment under three scenarios. 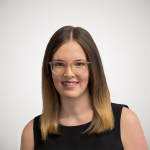 Under prior law, if a business made a $100 QIP investment that had a 15-year cost recovery period, it would generally have been able to recover $84.38 of that initial investment cost over the life of the asset. But due to the last-minute drafting error in the TCJA, QIP was excluded from 100 percent bonus depreciation. Now, if a business makes a QIP investment, it can generally only recover $42.12 of that initial investment cost. These firms are now worse off than they were before tax reform. This very large difference in the after-tax cost of making improvements is causing a delay in some store and restaurant remodeling projects, as well as causing some retailers to decline opportunities to purchase or lease new store locations that would require substantial improvements. While the Tax Cuts and Jobs Act effectively removed tax barriers to many categories of business investment, it also created barriers for investing in qualified improvement property, seemingly by mistake. The tax burden on building improvements should not have worsened due to tax reform; this drafting error is reportedly already having consequences, slowing investment, employment, and output as businesses choose not to pursue investment opportunities. Lawmakers should work to extend 100 percent bonus depreciation to qualified improvement property; at a minimum, they should make sure that the rules for deducting the cost of building improvements do not remain more restrictive than under previous law.